Overall, I like my tennis game. My strokes have good form, I have all the shots, I rarely double-fault, and I’m quick around the court. However, I do have a weakness, my head. 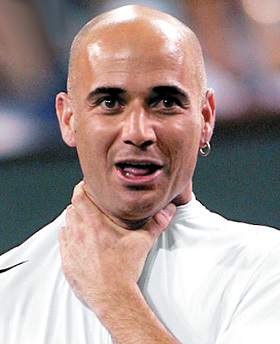 Sometimes (much more often than I’d like), I get tight on the court; I choke. The court starts looking very small. Like, my opponent is everywhere. My shots will get weak. I’ll hit off my back foot. I’ll not react to shots. I’ll start hitting shots wildly all over the court with no control. I know people say it happens to everyone but for some reason I feel particularly susceptible. I haven’t really figured out how to beat it but sometimes it’s more of an issue than other times. I desperately want to figure out what causes it. I’ve played for years without really addressing it because overall, I’ve been pretty successful. When I win, I feel like I beat both my opponent and my head. When I lose, I blame myself rather than the opponent. But it’s holding me back. I feel I should be beating certain players that I’m not. I play so well in practices and then in matches, my game changes. My technique for dealing with this nervousness has been to try talk myself out of it when I feel it coming on. Taking deep breaths, telling myself to relax, focus, whatever. It doesn’t really work. However lately, I’ve been trying something else. Practice makes perfect right? It’s hard to practice not being nervous in a match. Therefore, the only time to practice is during a match. Now, when I feel myself getting tight and nervous, I embrace it. I tell myself, “Ok, soak it up. Here’s a chance to try figure out how to play in this situation”. Instead of fighting it, I try encourage it. So far so good too. I’ve had some recent matches where normally it would have got the best of me. I figure I can only conquer it when I get some practice doing so. But this is risky; in really important matches, I don’t want to practice it. I just want to win. Anyway, just thought I’d share. There MUST be others like me out there.